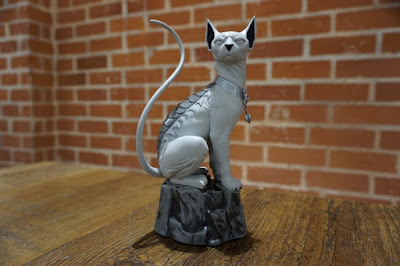 Image Comics/Skybound is pleased to reveal an exclusive SAGA statue of the fan-favorite character Lying Cat in celebration of this year’s Local Comic Shop Day. This exquisitely detailed, limited edition, black-and-white Lying Cat will be an eight inch resin statue, hand numbered, and limited to 300 pieces worldwide. The LCSD Lying Cat statue (Diamond Code AUG168737) will be available on Saturday, November 19th, 2016 at participating comic book retailers. The final order cutoff deadline is Monday, September 26th, 2016. Local Comic Shop Day® will be held on November 19, 2016 this year.